Yesterday, Jos.A. Smith and I visited the Brooklyn Museum to take in 3 extraordinary shows. I wasn't familiar with one of the artists who ended up being the one that left me awestruck. 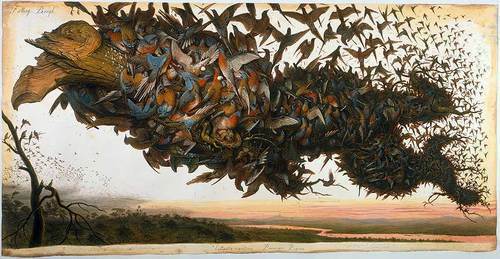 Walton Ford meticulously renders large scale fantasical looking animals in a style reminicent of early scientific depictions, and Audubon's work. Look further and they become metaphors for contemporary issues, complete with hidden imagery, scrawled notes, and an attention to detail that never gets "tight", all on carefully distressed paper. The works are beautifully rendered and powerfully moving. Highly recommended. 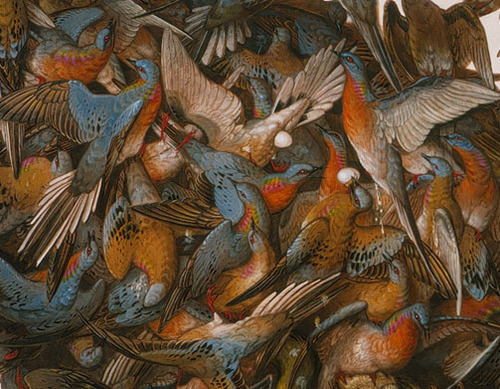 New York–born artist Walton Ford, a 1982 graduate of the Rhode Island School of Design, draws inspiration from the work of such nineteenth-century artists as the naturalist John James Audubon and the French caricaturist J.J. Grandville, whose part-human, part-animal subjects satirize man's shortcomings. This exhibition presents more than fifty of Ford's large-scale, meticulously executed watercolors from the 1990s to the present, which depict birds and animals in a style resembling Audubon's prodigious Birds of America—but with a significant twist. While beautiful, Ford's paintings often portray scenes of violence and offer a wry critique of colonialism, the naturalist tradition, and the relationship between man and animal. Tigers of Wrath: Watercolors by Walton Ford is organized for the Brooklyn Museum by Marilyn Kushner, Curator of Prints and Drawings. Hi David, This guy is fantastic. For those of us in the hinterland there is a book of his work titled "Walton Ford". As a side note, Walton's dad was Flicky Ford, an AD at Time Magazine and Jack Davis' best friend from high school down here in Atlanta. When Walton came down to UGA to give a talk on his work they met, I think for the first time. Three of us went to a place down here in the woods called Heavy's Bar-B-Q that is full of all sorts of wierd taxedermy diaramas and specimen... interesting place to gnaw on a rib bone. Thanks for the post, will see it saturday! Amazing work Dave. Thanks for posting this. I wish I had the time to see it. Thanks Dave, This artist has gotten a lot of interest in the last several years. Great work. There are a lot of shows going on now, hard to get to all of them! Ah, New York!!! I just read a feature on Walton Ford in, of all places, Berkshire Living Magazine. Apparently, he lives in Western Massachusetts. He's paid his dues and now he sells everything before it's even painted. Seems like a solid and ever so slightly tortured regular kind of guy. There's a school of painting that has developed that takes on these issues of Man & Nature and uses traditional rendering methods to pose the thorny questions. Isabella Kirkland is a San Francisco painter who does a Dutch still life version. It's an interesting trend and strategy. The artist gets to have her cake and eat it too because collectors LOVE this blue chip stuff. This looks amazing. I hope I can get out there to see it in person. Thanks for posting this, David.